All three M Donnelly All-Ireland Poc Fada titles were retained for the first time ever on the Annaverna Mountain in Co Louth this afternoon. Tipperary’s veteran goalkeeper Brendan Cummins claimed his sixth senior title, completing the course in 39 pucks. Derry’s Ruairi Convery came second, with Down goalkeeper Graham Clarke finishing in third spot. Meanwhile, Waterford’s Patricia Jackman took her third Camogie title. Offaly’s Cillian Kiely became the first youngster to take consecutive U-16 titles, beating his record of last year by two pocs. There was double success for Tipp star Cummins, who also won the pairs competition with Antrim’s Kevin McKernan. The 2012 M. Donnelly All Ireland Poc Fada takes place next Saturday August 4, at the Anaverna Mountain, Ravensdale, Cooley, County Louth, commencing at 12pm. The 2012 Finals feature a number of returning competitors in all events, with no less than three Senior All Ireland Poc Fada Champions competing in the mens event. Gerry Fallon (2009), Graham Clarke (2010) and defending champion Brendan Cummins, who will be looking for a 6th title this weekend. Cillian Kiely of Offaly will attempt to defend his Under 16 title. Patricia Jackman will also be looking to defend her senior Camogie title, but will have to contend with stiff competition, including that of Rachel Monaghan, last year’s runner up. See below for competitor biographies. The 2011 GAA-GPA All-Star goalkeeper made his Senior Hurling debut for Dublin in 2004 and has five Dublin SHC titles along with the Allianz National Hurling League Division 1 title with Dublin in 2011. Derry Senior talisman makes only his second journey to the Anaverna Mountain today, despite taking his fourth Ulster crown last month. The Swatragh clubman finished second on his debut bow in the All-Ireland competition in 2008. The Drumcullen goalkeeper makes his debut bow on the Anaverna Mountain today, hoping to follow in the footsteps of former Offaly man Albert Kelly, who took All-Ireland honours in 1992, 1993 and 1998. Charleville, Cork native Jake is hoping to become the first man representing Europe to take All-Ireland Poc Fada honours. He captained Paris Gaels in 2012 and also was the top-scorer in the European Hurling Championship with 4-40. It is a first trip to the Anaverna Mountain for Joe, who earned his place in this All-Ireland by taking Leinster honours. The 24-year old is joined by fellow Drumcullen clubman Damien Spain in Cooley this afternoon. The Oran clubman captured M Donnelly All-Ireland Poc Fada honours in 2009, and also claimed the pairs title with James Skehill in 2010. Jerry earned his place on the Anaverna Mountain today finishing second in Connacht. It’s a first trip to the Anaverna Mountain for Kevin, who finished second to Ruairi Convery in the Ulster Poc Fada. The Sarsfields clubman is also looking forward to an All-Ireland Under 21 semi-final with Antrim later this month. 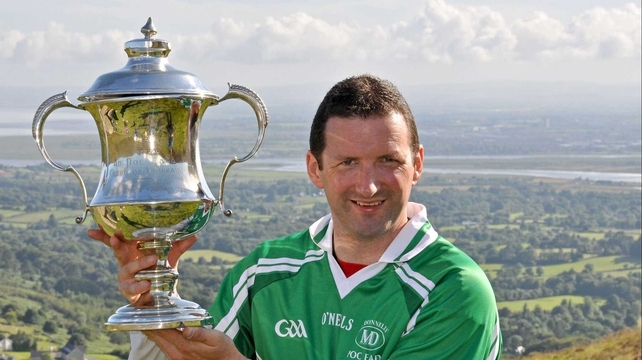 The Kinvara clubman is the 2012 Connacht Poc Fada champion and is the former Galway Senior Goalkeeper. He has one Allianz National Hurling League Division 1 title with the Tribesmen. Seamus returns to the Mountain after his second place finish in the Munster final this year. The UCC student took Munster honours in 2010 and finished in eighth spot, in 59 pocs on his first All-Ireland appearance. The 2010 M Donnelly All Ireland Poc Fada Champion who first took on Anaverna Mountain in 2002 will be hoping to once again take honours, after the Ballygalget Clubman came second last year. The Causeway native has done Kerry hurling proud over the years and has even featured for Limerick hurlers. The 29-year old has won All-Ireland Minor B and U21 B Championships with Kerry, and a Division 2 Allianz Hurling title with Limerick. Brendan is certainly the recent ‘King of the Anaverna Mountain’ and picked up his fifth M.Donnelly All-Ireland Poc Fada title last year to match his number of All-Stars. He holds the course record of 48 pocs. Strabane clubman Gavin took Ulster honours in 48 pocs, four ahead of Armagh’s Finnen Maguire. Watergrasshill clubman Colum took Munster honours at Thurles Racecourse thanks to a one-poc victory in 18 pocs. The Kinvara clubman finished second in the Galway Poc Fada but made amends in Toreen to take Connacht Under 16 Poc Fada honours. 16-year old Cillian is getting a rare chance to defend the All-Ireland title which he won on the Anaverna Mountain last year. Played with county at under age and senior level, Played with u16 county in 3 all Ireland finals and Armagh seniors in Ulster Final. Plays club camogie with Ballymacnab as a forward and a goal keeper. Galway Minor All Ireland 2009 & 2012. Galway U16 All Ireland 2009 & 2010. 6 Connacht School Medals All Ireland Féile runners up 2008. Poc Fada runner up 2011. Plays corner forward with Limerick Intermediate team and with her club Croagh/Kilfinny. 2 All Ireland titles U/16 “B” and Minor “B” in 2011 and a Féile title in 2008. 2 World Handball titles and is a member of the Irish Handball Team in the Olympics 2012.